In my post on becoming a sticky note ninja, I shared different ways that you can brainstorm either individually or in groups using Post-it notes. You can also use Post-it notes to create a storyboard for a video, story, or presentation. A storyboard is a series of still images that depict the different scenes of a story. Traditionally, storyboards have been used in the film industry to plan the different events in a plot, decide how best to film each scene, and plan what is required for each aspect of creating the movie. Walt Disney is attributed as the creator of the use of storyboards. Even before he created the Disney company, Walt used storyboards to rough out his animated, short cartoons. By the time he created Snow White, his company was using storyboards to represent the complete, full-length movie. By 1939, storyboards made the transition from animate to live action, and Gone With The Wind was the first live action film to utilize this technique. Since then, most movies have relied on the storyboarding technique as a pre-production tool. 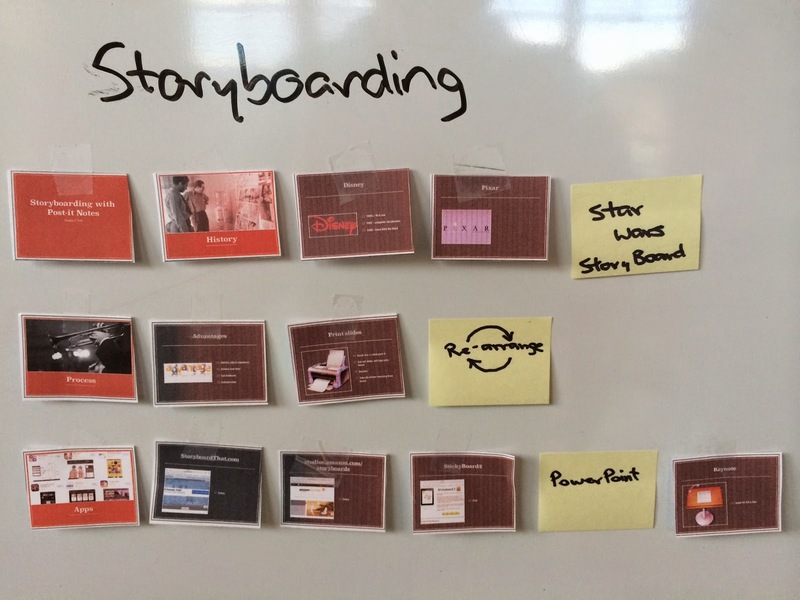 More recently, storyboards have been used in the planning process for business presentations. The idea of using a visual space to plan presentations is extremely productive as it helps ensure that the presentation flows well. The process is easy to integrate into your current workflow as it relates to presentation design. Print whatever slides you already have as 9 slides per page (PowerPoint) or 16 slides per page (Keynote). This will print your slides at a size that is the same as a 1.5x2.0 inch Post-it note. Thus, you can add extra notes to represent additional slides that may be needed. Tape all of the slides onto a whiteboard or other smooth surface (like a back of a door or a window). Re-arrange slides as needed while inserting Post-it notes. Capture the new arrangement using your smart phone camera. Carefully pull-off the slides in order so that you can use the stack as a reference when working on your computer. If you did the planning in your office, you may be able to view the whiteboard from your computer. Below is the capture of my presentation which is available at Slideshare.net and embedded below. Should you choose to stay in the electronic realm for your planning, these apps will be helpful. Both Keynote and PowerPoint are presentation apps that can let you rearrange slides in a slide sorter view. This is not a comprehensive list of apps or online sites to create storyboards, but it does represent apps that I have experimented with. Great article. Thanks for sharing. Our clients have been using Teamput (http://teamput.com) for storyboarding. It's super easy to create notes and drag images to shared canvases.